Correection: The starfish is actually by Kathy Shield Dummer, not Rachel Gourley as previously stated. I apologize for the misidentification. 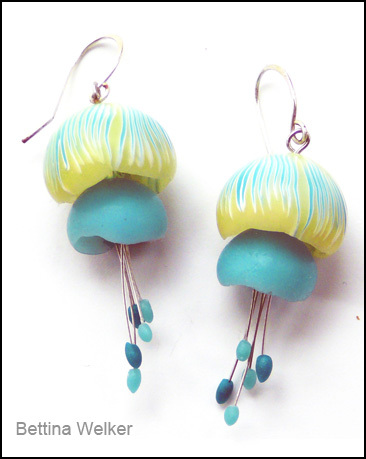 I purchased these jellyfish earrings by Bettina Welker at Synergy 3 last March. I love the playfulness of their design and the way the translucent and opaque clays were combined to to create the very jellyfish-like upper bell. The tentacles are made of silver wire with blobs of semitransparent clay affixed to the ends. The loose loop to loop connection between the cap of the jellyfish and the ear wire causes the earrings to jiggle delightfully when worn. I believe the clay is Pardo. 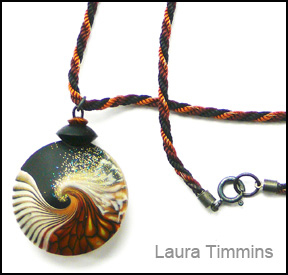 This elegant wave pendant by Laura Timmins has long been a favorite of mine. I love the color and sense of motion in the wave and the way glitter was used to create the appearance of sea spray. The matte finished gunmetal findings tie in beautifully with the matte background of the wave and with the black matte accent bead. Laura’s substantial, hand made twisted cord raises the entire piece to a higher level. It echoes the colors in the pendant and contains a barely visible strand of metallic gold among the threads that ties it in with the glitter in the focal bead. Last but not least both the pendant and the cord are wonderful to touch. 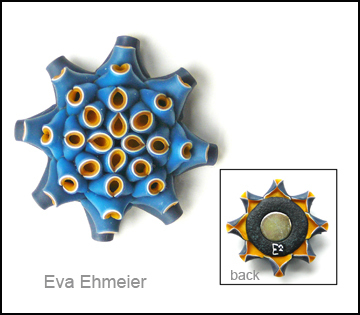 This brooch by Eva Ehmeier reminds me of a life form one might find in a tide pool. The white layer of clay between the blue and gold crisply accents the the curlicue design of the protruding forms. The back is as elegantly finished as the front. A gold starlike design surrounds a textured black circle inside of which sits a metal magnet. The matching magnet is placed inside the garment to hold the brooch securely in place. 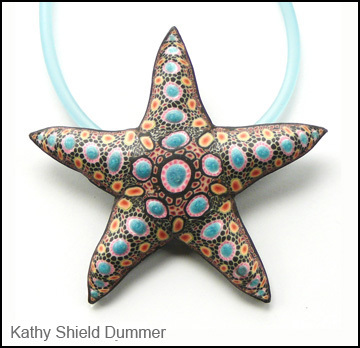 I love the way the simple bullseye canes in different colors and sizes have been applied to the sculpted form of a starfish to create a very realistically patterned starfish “skin” on this pendant by Kathy Shield Dummer. The blue dots are raised to create a pebbly surface like that on real-life starfish. The Soft Glass cord passes through a clay tube on the back of the starfish. It appears that the colors, especially the blue conain some mica clay. To my eye this has an Expressionist look to it. What do you think? 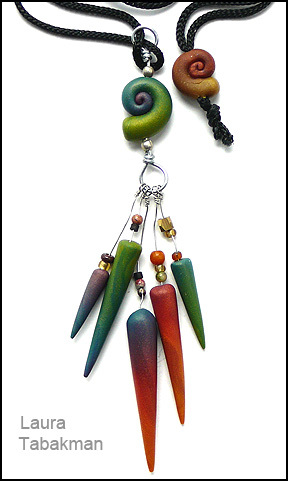 The colors and shading in this delicate pendant necklace by Laura Tabakman are from Skinner blends using Premo mica clays. The rich blends accentuate the simple but elegant forms of the pendant components. The pendant consists of a shell form with dangling conical components connected by light wire. Tiny sparkly beads along the wires create the appearance of sand grains. The lightweight tassel cord is a perfect compliment for the dainty proportions of the pendant. I love the concept of this piece but I’ve found that over time the light wires become bent and twisted so that they no longer dangle freely. I wonder if using the finest possible beading chain in place of the wire would eliminate the bending and twisting while still producing the desired effect. UPDATE: Laura tells me she now uses heavier wire and no longer has a problem with bending; I actually have a prototype. A small but lovely collection. Barb and Irene brought back some nice pieces from Synergy too. Love that you shared these Carol! They are all gorgeous. I was fortunate enough to be able to start my own collection at Synergy3. I picked up some amazing work from nearly all of my favorite artists! Ditto, Jan. Thank you for sharing some of your favorite pieces from other artists. Your admiration of their work is a high compliment to them. Thank you Carol for featuring my piece! That was one of the first pieces on that series, now I’m using half hard wire and solved the bending problem. I am one of the lucky ones who saw the collection and it’s amazing! I am thrilled to be a part if it. Thank you Laura. I’m glad you figured out a solution to the kinks. Thanks for all the kind words about my piece Carol! You are welcome Laura. You know I love your work! You are welcome Eva. I love your work.